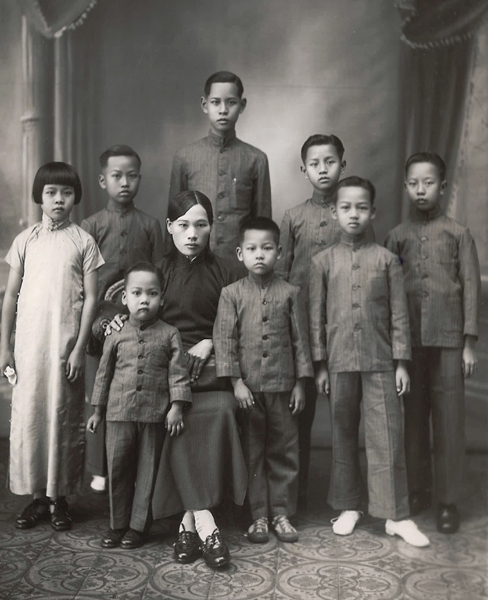 “Portrait of Ng Yat Chin family,“ 1938, Chinese Exclusion Act case files, RG 85, National Archives-Seattle, Ng Yat Chin case file, Seattle Box 782, 7030/11868. Ng Yat Chin was 16 years old when he arrived at the Port of Seattle on 11 February 1939. He was a student and admitted as a U.S. citizen, the son of a native Ng Ah Wo. His father was a Hawaiian-born U.S. citizen whose file #359-G was sent to Immigration in Seattle for their review. As the interrogation started Ng Yat Chin was reminded that it was his burden to prove that he was not subject to exclusion under any provision of the immigration and Chinese Exclusion laws, therefore having the right to enter the United States. Ng Yat Chin was born on 12 June 1922 in Nom Chin, Lung Do section, Heung San district, China. Nom Chin was a large village with about 500 houses. Ng Yat Chin gave a very detailed description of the layout of the village and his family home. He was asked to describe his father’s double house and produce a diagram of the floor plan. Ng Yat Chin’s father and brother also testified on his behalf. The interrogators compared a map of the house and courtyard drawn by Ng Yat Dong when he was admitted to the U.S. in November 1938 with the map Ng Yat Chin had drawn during his interrogation. The two brothers both belonged to the Boy Scouts when they lived in Nom Chin. Ng Ah Wo was born in Hawaii and lived there until he moved to San Francisco in 1905. His citizenship status was accepted by Immigration Service on the many trips he made from the U.S. to China and back over the years. Ng Yat Chin and his family moved to Hong Kong in 1938. His father operated Canton Noodle Company and the family lived on the third floor above the factory. After thirty pages of interrogations and re-examinations of Ng Yat Chin, his father and brother, and in spite of minor discrepancies, Ng Yat Chin was admitted to enter the United States in March 1939.